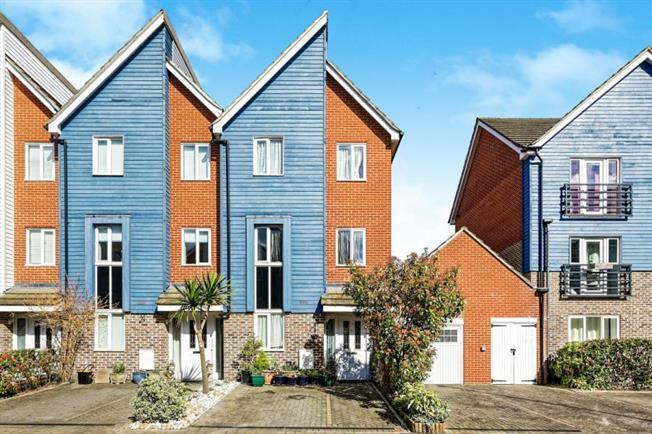 3 Bedroom Town House For Sale in Faversham for Offers in excess of £320,000. 3 bedroom townhouse located in a highly popular area of Faversham and within walking distance of the town centre and train station. Located over 3 floors the property provides versatile living accommodation. To the ground floor there is a large kitchen diner with patio doors leading out into the garden. There is also a separate sitting room/study which could easily be used as a 4th bedroom. On the first floor there is a generous sized lounge, double bedroom and family bathroom. Leading up the stairs to the 3rd floor you will find the master bedroom with en-suite and another double bedroom. The property also benefits from off street parking and a garage.